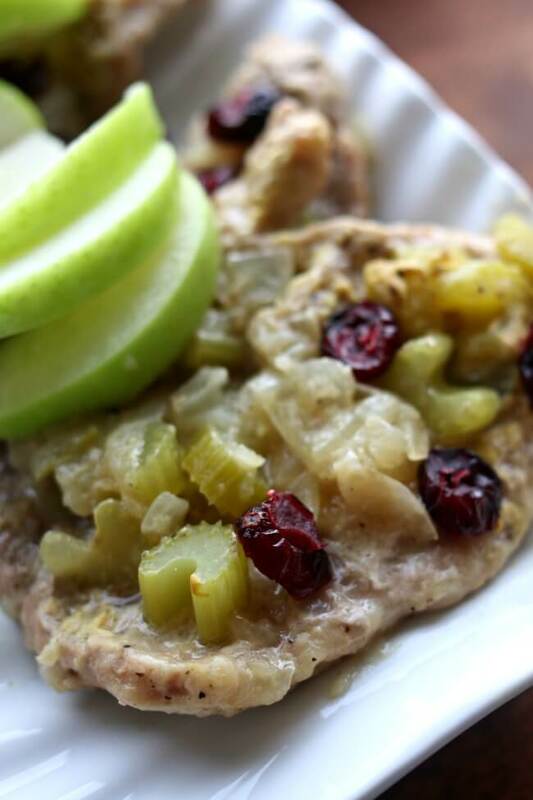 Pork chops and apple sauce just seem to go well together, don’t they? 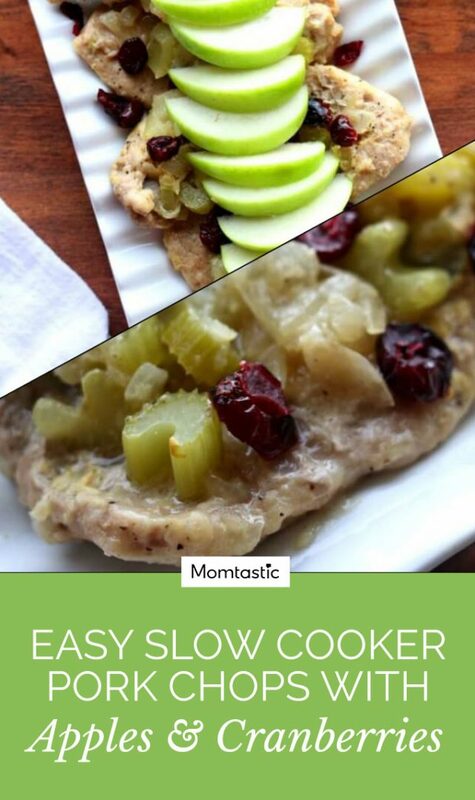 And with this easy slow cooker pork chops recipe you can make the chops and the applesauce at the same time. I’m always on the hunt for an easy weeknight meal and this only took me about 10 minutes to combine everything before I tossed it in the slow cooker. It can take you less time if you don’t sear the chops first, but I think the extra step is worth it. 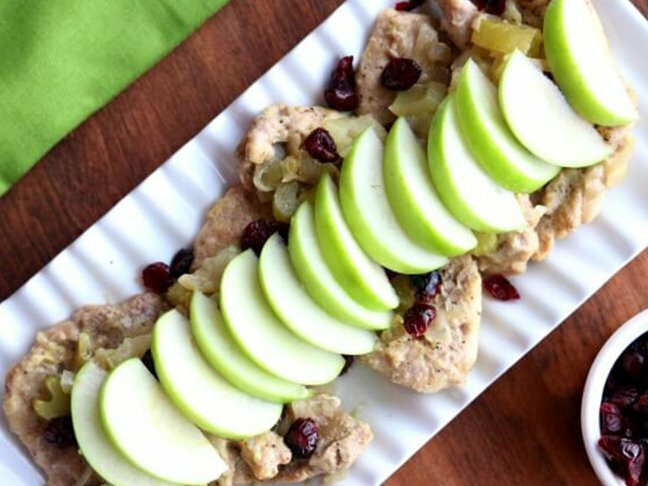 Add some extra apples and dried cranberries at the end and serve with your favorite side dish for a comforting and delicious meal. 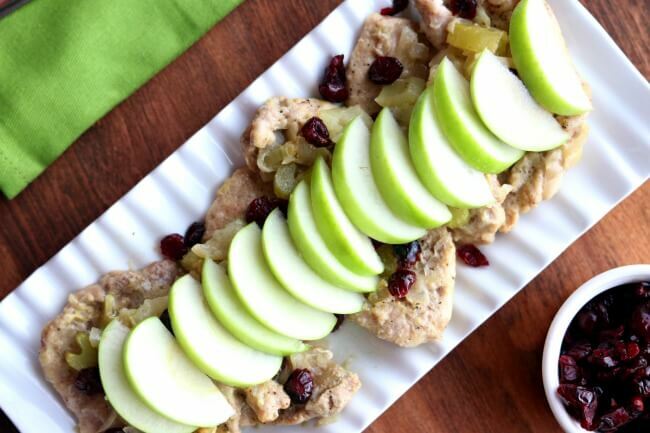 This delish dinner idea takes only 10 minutes of prep work. Step 1: In a slow cooker (4-6 quart size is ideal) combine the onion, celery, apple juice, vinegar, dijon mustard, 1/4 tsp salt, and 1/4 tsp pepper. Stir. Slice one of the apples and add it to the slow cooker. Step 2: Place the 1/4 cup flour, 1/2 tsp salt, and 1/2 tsp pepper in a pie tin. Dredge each of the pork chops lightly in the flour. Step 3: Warm the oil in a pan on the stove over medium high heat. When the oil is hot, quickly sear each of the pork chops for about 1 minute on each side. Add the seared pork chops to the slow cooker. Step 4: Cover the slow cooker and cook on low for 2 hours. Remove the lid and smash the apple into an apple sauce consistency (see photos). Toss the cranberries into the slow cooker. Step 5: Dice the remaining apple and toss into the slow cooker. 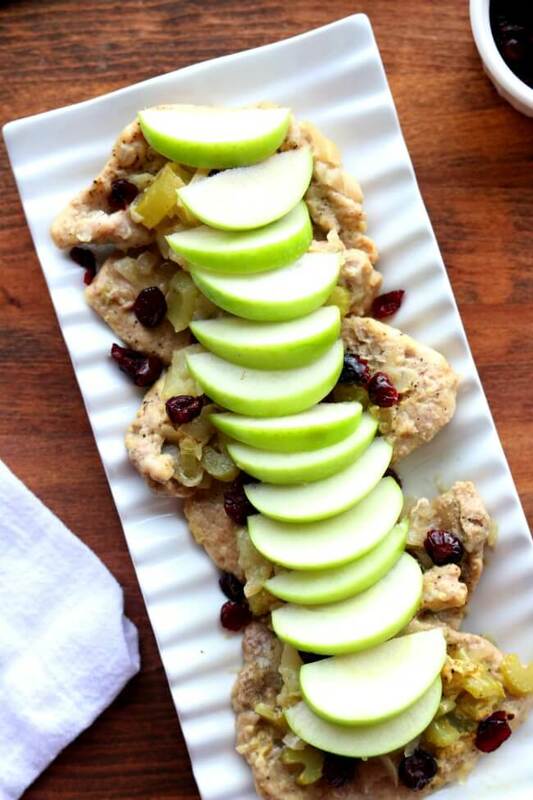 Serve each pork chop with the sauce and some of the crunchy apples and a few of the cranberries. Note: I chose thin cut chops that were probably only a quarter inch, almost pancake flat. So they cooked fairly quickly, even in the slow cooker. Mine were done in 2 hours on low. If you choose to buy a thicker cut the cooking time might be a little different.